contact with the melt when processing its Teflon fluoropoly- mers. The materials of choice are nickel-based alloys such as Hastelloy, Inconel, Monel, and Haynes, which are not affected by the acids. DuPont also notes that hardened electroless-nickel plate can be used, but even small holes, chips, or cracks in the plating can degrade performance. Chrome-plated barrels and screws are not recommended for processing fluropolymers. NatureWorks, manufacturer of Ingeo bioplastics, recom- mends use of stainless steel for all processing equipment to minimize corrosion, noting that PLA should not be left in the extruder, polymer filter, transfer lines, or other part of the ex- trusion system at melt temperatures for extended periods. Corrosion-resistant materials have a lower coefficient of thermal expansion (CTE) than standard steel, which can cause trouble during processing high-temperature resins such as fluoropolymers. When the CTE of the barrel is different from that of the screw, the screw/barrel clearance changes, which can cause the screw to bind and damage the barrel. Matching the screw and barrel is important due to the lower thermal conductivity of corrosion-resistant materials. Screw and barrel manufacturers can provide expertise in pairing these components. Abrasive wear, which is caused when gritty reinforcements and other hard particles scour the barrel and screw surfaces, can be combated by using hardened, wear-resistant alloys and coat- ings. Tungsten alloys for barrel linings and screw hardfacings offer excellent protection against abrasive wear. Carbon content affects an alloy's hardness. For screws, medi- um-carbon, heat-treated steel is typically used as a base on which hardfacings are welded to the tops of the flights. Screws often are surfaced with hard cobalt- or nickel-based weldments or manufactured with tool steels that can be case- hardened or through-hardened. Colmonoy 56, a nickel-chrome- boron alloy, is often used to protect screws against mildly cor- rosive and mildly abrasive resins. Colmonoy 83 hardfacing offers more protection at a higher price. Bimetallic barrel liners of abrasion-resistant alloys offer protection against various wear conditions and provide a range of cost/performance options. Among the best in terms of corrosion resistance are HIP (hot isostatic pressing) barrels for injection molding and extrusion. Even fluoropolymers are no threat to these barrels, which have a protective layer of nickel-rich boron alloy containing molybdenum and a matrix of borides and carbides. When used with corrosion-resistant screws, HIP barrels are said to reduce substantially the absorption of iron particles from the barrel bore into the melted polymer. Of course, this degree of protection comes with a much higher price tag. Nickel- chrome and tungsten barrels can be used as long as the barrel discharge end is cast in Inconel and the surfaces of the trans- ducer holes and flanges are made with Inconel as well. Those barrels can be bought for considerably less than HIP barrels. 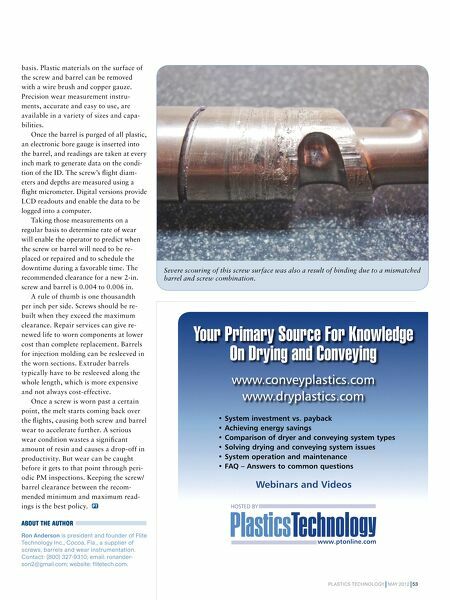 52 MAY 2012 PLASTICS TECHNOLOGY Extreme wear on these screw flights was caused by bind- ing due to a difference in coefficient of thermal expansion between the barrel and screw. 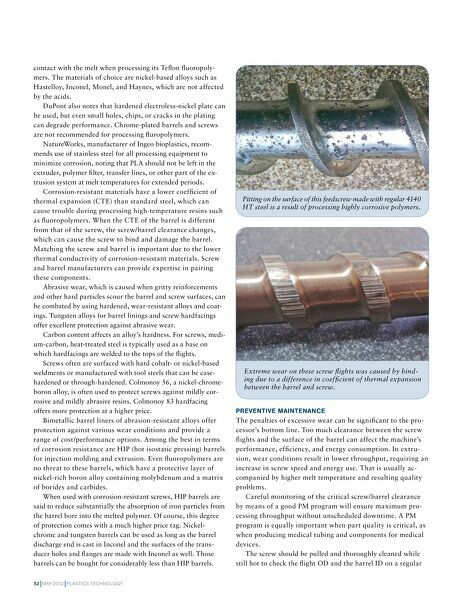 PREVENTIVE MAINTENANCE The penalties of excessive wear can be significant to the pro- cessor's bottom line. Too much clearance between the screw flights and the surface of the barrel can affect the machine's performance, efficiency, and energy consumption. In extru- sion, wear conditions result in lower throughput, requiring an increase in screw speed and energy use. That is usually ac- companied by higher melt temperature and resulting quality problems. Careful monitoring of the critical screw/barrel clearance by means of a good PM program will ensure maximum pro- cessing throughput without unscheduled downtime. A PM program is equally important when part quality is critical, as when producing medical tubing and components for medical devices. The screw should be pulled and thoroughly cleaned while still hot to check the flight OD and the barrel ID on a regular Pitting on the surface of this feedscrew made with regular 4140 HT steel is a result of processing highly corrosive polymers.